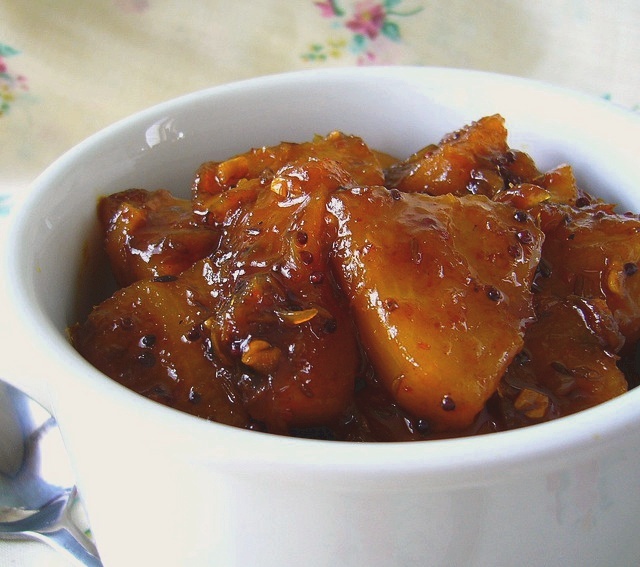 Recipe for Pineapple Chutney. Made with sugar, green chillies, red chillies, ginger, garlic, briyani powder, cinnamon stick, cardamom, mustard seed, lime juice and water. Heat cooking oil in a pot. Fry pounded ingredients with cardamom, mustard seeds, cinnamon stick till fragrant then add in briyani powder. Add in pineapple slices, chillies, salt and water. Let it boil for about 10 minutes. Add in sugar and vinegar. Continue to boil for another 10 minutes. Remove from heat and keep aside for 1/2 hour at least before serving. When serving only take the sliced pineapple and chillies. Serve with Nasi briyani or Nasi minyak.